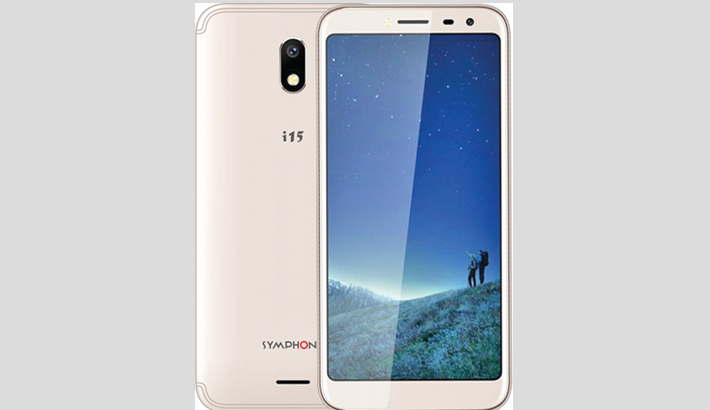 Symphony launched a new model with full vision display called ‘Symphony i15’ to carry on the legacy of this amazing series recently. Its 8.9mm slim body and non-traditional design is sure to provide excellent gripping. 18:9 display-to-body ratio gives it a totally premium look, said a press release. A 5.45” narrow bezel display is provided with HD+ resolution that can accommodate 1440 × 720 pixels. Web browsing, video playback and gaming experience will be superb because of 296 PPI that is further complemented by the premium outlook of the Full vision display. The Android Go 8.1 operating system is powered by a quad-core 64 bit processor. It has 1GB of RAM and 8GB ROM. Expandable memory is up to 64GB. i15 has 8MP rear camera with f/2.0 aperture for capturing beautiful pictures. 5MP selfie camera guarantees the coolest selfies with moon light flash. The i15 can be found all over the Bangladesh in two colors, gold and blue black.